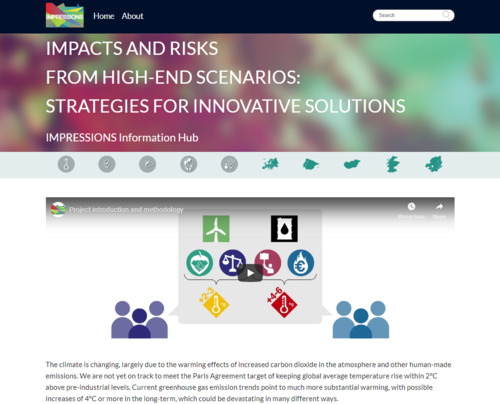 With climate change becoming an increasingly hot topic globally, the EU-funded project IMPRESSIONS launches a new online resource to provide a scientifically robust and policy-relevant understanding of the nature and scale of more extreme and long-term consequences of climate and socio-economic change, and guide the use of this knowledge by decision-makers working on adaptation, mitigation and sustainable development. The climate is changing, largely due to the warming effects of increased carbon dioxide in the atmosphere and other human-made emissions. We are not yet on track to meet the Paris Agreement goal to limit global average temperatures to 2°C (and ideally 1.5°C) above pre-industrial levels. Current greenhouse gas emission trends point to much more substantial warming, with possible increases of 4°C or more in the long-term, which could be devastating in many different ways. The High-end Solutions Information Hub is a synthesis of the knowledge and results acquired during a 5-year collaboration of 26 partners from different scientific backgrounds and 16 European countries, who have worked intensively with numerous stakeholders. The resource guides scientists and practitioners alike through interactive and user-friendly collections of results, recommendations and methods, to assist decision-making and future research in adaptation and mitigation measures in a future involving extreme climate and socio-economic change. The IMPRESSIONS project researched what a future above 2°C could look like, which we define as "high-end climate change". The project also assessed what decisions we can take to help reduce the impacts of such high-end climate change. However, climate change isn’t the only problem the world faces; we live in a world with poverty, poor health, water shortages, a lack of food security, land degradation, resource depletion, mounting social inequalities and weak governance systems. These global problems are all closely interlinked and our current solutions for tackling them tend to be over-simplistic. IMPRESSIONS has modelled the possible impacts of high-end climate change combined with other key global challenges for five case studies across Europe and Central Asia. Stakeholders have helped develop a vision for what we want the year 2100 to look like, as well as pathways and concrete guidelines for action to move society closer to this vision of a sustainable future. What could a future above 2°C look like? What are the consequences of a future above 2°C? What do we want our future to look like? How can a sustainable world be achieved? "We need considerably greater mitigation efforts to achieve the Paris Agreement target, and so it is important that we also prepare for the consequences of high-end climate change. Our research shows that concerted and coordinated action is needed at all scales and in all sectors to develop and implement pathways for adaptation, mitigation and transformation towards sustainable lifestyles and economies," explains project co-ordinator Prof Prof Paula Harrison, Center for Ecology and Hydrology (CEH), UK. The new resource is openly available at www.highendsolutions.eu. Twelve explanatory videos are available in the Information Hub and also on our YouTube Channel.